Was Ireland Baldwin's Costume Offensive? The subject of offensive Halloween costumes is a very tricky one and, like anything dealing with political correctness, is bound to inspire lots of bitterness, yelling, and CAPS LOCK. So, it was no surprise that when Ireland Baldwin posted photos of herself dressed as the Indian Chief from Peter Pan on Instagram and Twitter, people were quick to attack — and viciously. Baldwin cited the ubiquity of the costume as a justification. However, just because something is popular doesn't mean it's a good thing. Cultural appropriation as an issue is widely misunderstood and is all too often passed off as over-sensitivity propagated by the evil liberal media. In fact, it's based on the very simple request of certain cultural groups — not every single individual in these groups, but many of them — that their lives, their backgrounds, their history, and their particular slice of American society be viewed as something more than a costume or a make-believe character. When a very stereotypical costume representing an extremely limited view of what it means to be Native American is available in a Halloween pop-up shop, that simply reflects continued ignorance. The purchaser should still, ideally, be thinking critically about that decision; after all, there are hundreds of costumes on display, and the choice to buy one over the other requires some conscious thought. Again, ubiquity does not equal sensitivity. Disney has never been immune to racism — far from it. Moreover, this is a character from a 1953 film — an era when racism ran rampant with little consequence. Certainly, it doesn't take a lot to see why the portrayal of "red men" in Peter Pan could be viewed as problematic. Baldwin is young and probably grew up with this movie, and while it's okay to love the story, it's not okay to simply accept it because it's Disney. The fact that this kind of stereotyping exists in something that is widely consumed by young children who don't have the ability to think critically — well, that's a huge part of why people grow up into adults who don't know any better. This is where the really grey area begins, and ultimately, it's a matter of personal preference. Some people would say that a culture can be imagined into a costume only by members of that same culture; others would argue that it's fair game for anyone as long as it's done with respect and research. 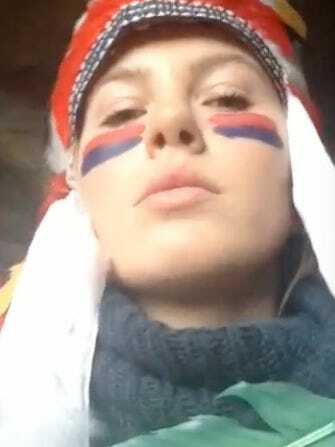 But, Ireland Baldwin's own racial heritage doesn't change the fact that by dressing up as Big Chief, she's harkening back to a very dated, offensive representation of Native Americans. Do you have to be offended by this? No. In fact, Baldwin retweeted several people who said that, as Native Americans themselves, they thought the costume was fun and cute. But, if you ask us, anyone who thinks to purchase one of these tone-deaf, mass-produced Halloween costumes also carries the onus to think about what they are representing. Deleted the picture because it was insulting all the poor little white girls who need a racial cause to be apart of for attention ? That statement is an entire discussion in and of itself. What do you think?